These cute little parchment pouches are a great “think outside of the box” type recipe! Easy one pouch dinner option! 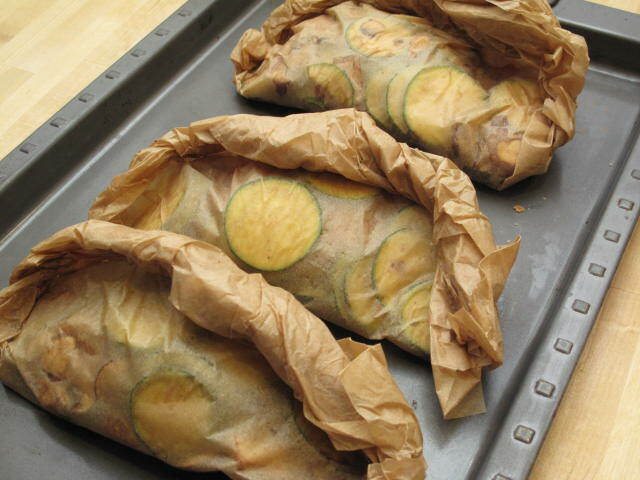 Spray the parchment paper with the cooking spray. First layer = cous cous (about ½ cup per parchment sheet). Second layer = shredded or thinly sliced squash (1/2 cup). rd layer = fish filet. th layer = lemon slices (about 2 slices each). Fold the parchment over the top of the fish pile. Fold in the edges to create an airtight pocket.